To advance women’s human rights in the Global South and North, Philanthropy Advancing Women’s Human Rights (PAWHR) mobilizes funders to share and leverage knowledge, deepen networks, and expand and drive resources. Formally established in 2014, PAWHR is an affinity group made up of private foundations and philanthropic advisors that advance women’s human rights globally through a rights-based approach to grant making. PAWHR currently comprises 12 donor-members that leverage close to $200 million USD annually to advance global women’s human rights. 2017: Channel made a grant to Philanthropy Advancing Women’s Human Rights (PAWHR) (via the fiscal sponsorship of the Proteus Fund), a funder affinity group for private women’s rights funders (of which Channel is a member), to support the Strategic Collaboration to Leverage Resources (SCLR) Pooled Fund. The SCLR Pooled Fund is a new technical assistance fund created to support women’s rights organizations’ ability to apply for and manage large grants or take advantage of advocacy opportunities that will increase resources for the women’s rights field. This is the first time Channel has contributed to a pooled fund which are typically created when multiple funders come together to “pool” their resources and focus their grant making efforts toward common goals. In this case, PAWHR members decided to create a pooled fund after increasingly receiving requests to support the costs associated with collaborative, joint funding initiatives. Applicants must be current or recent grantees of a PAWHR member institution and can apply for joint funding opportunities or advocacy opportunities. 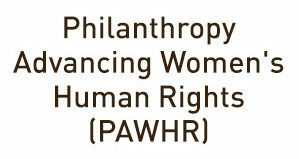 PAWHR hopes that the Pooled Fund will give at least two organizations, coalitions or networks a chance to collaboratively apply for or advocate for large grants that advance women’s human rights/gender equality that they would not be eligible to apply for individually (due to budget size, scope of Request for Proposal RFP etc). Funding decisions are made collectively by an Advisory Committee of those PAWHR members contributing to the Pooled Fund.